When I was new to mountaineering, I was often intimidated when I listened to experienced mountaineers talk. They always seemed to know where they were and could easily identify the peaks they could see all around them, when to me it just looked like a sea of peaks. Further, they would talk about the names of places and trails as though they were commonplace. Features like the Augerpoint Traverse, and names like Mount Albert-Edward, were just two of the many names everyone (other than me) seemed to know. It was overwhelming! Although I was interested in learning about the places, names, and locations, I couldn’t imagine a time when I’d be able to identify them all. Fast forward eight years, and today I can identify the shapes of many peaks amongst the sea. A big part of that is visiting a wide range of places, though I still struggle when I visit a new area. On top of being able to identify places, I’ve also met many of my hiking goals. 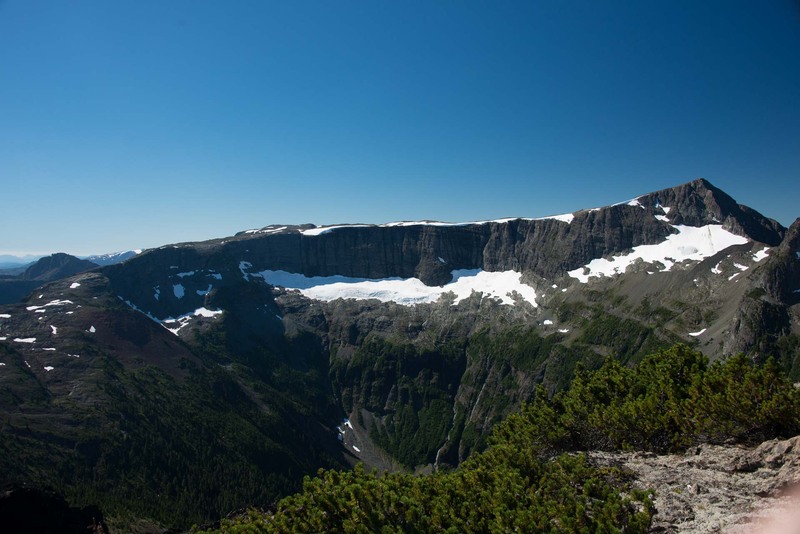 Since I started hiking, I’ve hiked many of the most common access points to Strathcona Park, and even managed to hike one of those routes I heard about long ago: the Augerpoint Traverse (sometimes referred to as the Mount Washington to Buttle Lake Traverse). 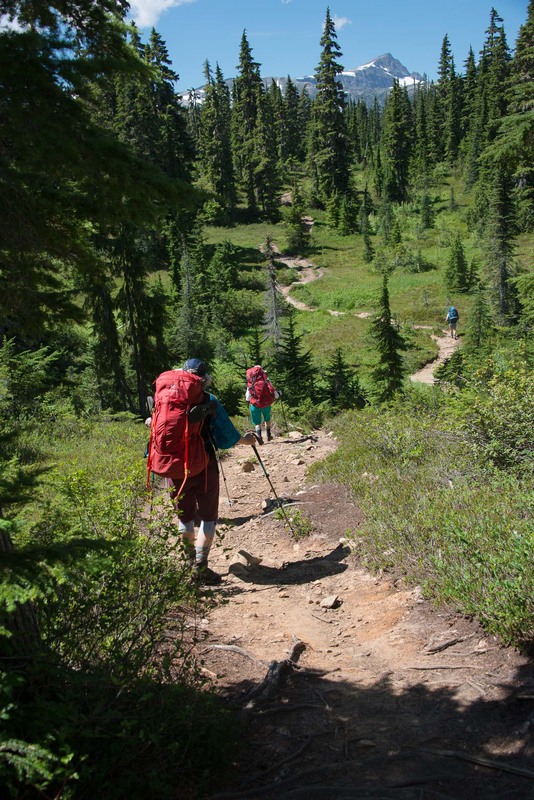 In August, I led a ragtag group of Island Mountain Ramblers on a five-day high island alpine adventure that everyone will remember for years to come. 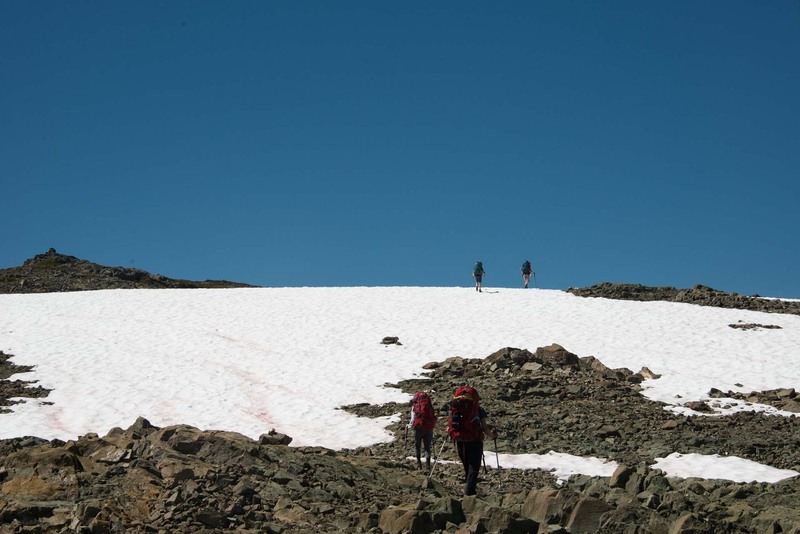 Some were reliving a trip they made in the 1990s; for others, it was their first multi-day alpine trip; and for me, it was an adventure in leading the group through complex hiking terrain. Along the way, we met our personal goals and made many of our summit objectives. This was my second trip on the Augerpoint Traverse; the first was in late August 2017 with Phil. That first trip was planned for six days and was to include summiting all the features along the way. But due to weather and water, we changed our plan and hiked the route in just three days, finishing the route at 1:30 am after a sixteen-and-a-half-hour day in which we managed to summit Pearl, Northwest Peak (Jack’s Fell), Syd Watts, Sid Williams, and Augerpoint Mountain. 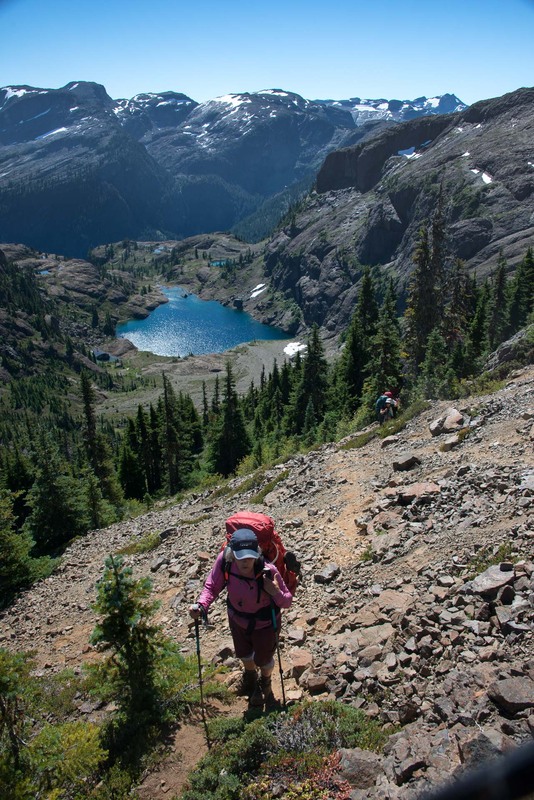 This second trip was far less ambitious: our five-day agenda bypassed the more challenging and technical terrain, and allowed us time to camp at Ruth Masters Lake. We started as a group of eight. After a short rendezvous in the parking lot, with time given to repack bags, we were taking our first steps on the busy, well-packed trail to Lake Helen-Mackenzie. As with many large groups, members hiked at a variety of paces. The day was hot, and the meadows and trees conspired to trap the humidity, making it feel near thirty degrees. So as not to encourage my own blistering pace, I walked at the back of the group — or at least, I tried to. By the time I arrived at Lake Helen-Mackenzie, I discovered about half the group was swimming in the lake — some sans clothing. I remember thinking, Already? But I used that moment to relax, and reflected on my personal agenda. With a trip stretched over so many days, there was really no reason to hurry. And so, that’s the type of trip we had. 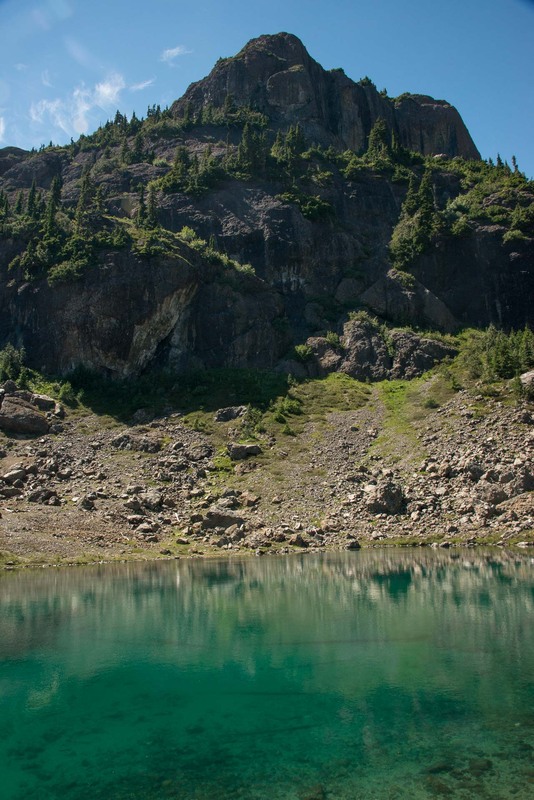 By the time we reached Circlet Lake, I was thoroughly relaxed, but still hot. I expected to find the lake packed (the location has earned the name Circus Lake for the hordes of people that frequent it), but since we started our trip on a Monday, we discovered that we had no problems finding seven tent pads for our group. Even by the evening, there were still tent pads remaining; better still, the other groups at the lake were pleasant and respectful. Our evening was spent swimming, eating, and comparing the gear in our backpacks — the usual. By the time the sun dropped behind Jutland Mountain and a few mosquitos appeared, I migrated to my tent to make my notes for this report. Day Two was our most challenging in terms of time, elevation gain, and technical terrain. The metrics noted above reflect my solo side trip to Jutland Mountain. We started at 8:00 am, hoping to get the steepest of the terrain and most of the elevation gain done before the heat of the day set in. The forecast was for high teens, but the reality saw temperatures in the high twenties to low thirties. 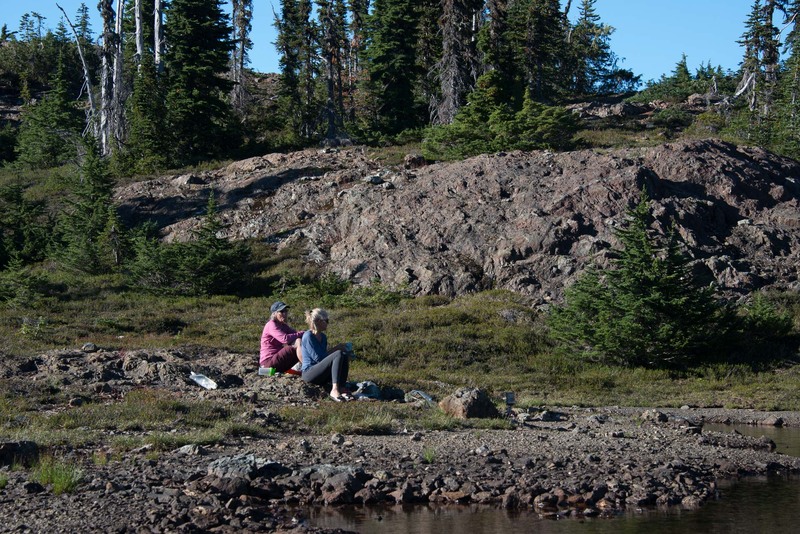 Once we climbed to the steppe above Circlet Lake, Dean invited me to head out on my side trip to Jutland. He took over and led the group toward Mount Albert-Edward, while I shot off on my own. The smart play would have been to leave my backpack hidden behind a rock, but it’s the mechanism by which I attach my camera case while hiking, and I was worried about leaving my food behind unprotected. I covered the terrain quickly as the boot track and cairns over the rock and through the heather are easy to follow. This quicker pace meant that I was soaked within thirty minutes. 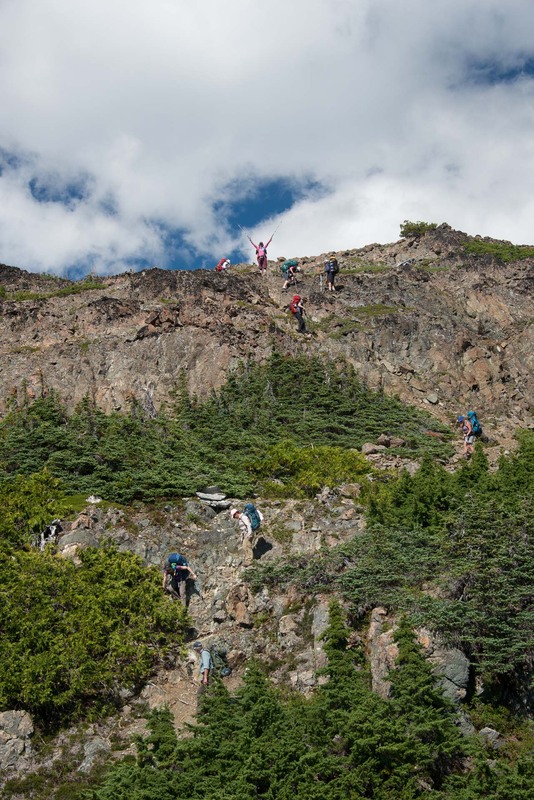 As compared to Mount Albert-Edward, the route along the ridge is more varied, and requires some route-finding. The final push to the summit of Jutland Mountain (1830m) requires a little hand on rock, but even with my backpack, it was easy. By 10:45 am, I was standing on the buggy summit, reading and signing the register. The completion of this otherwise unremarkable summit marks a major accomplishment for the progress on my island alpine quest, and one of the Island Mountain Ramblers’ hiking goals: summiting Jutland means I’ve completed all the peaks most easily accessed through Paradise Meadows. I caught up to the group just after noon on the ridge below Mount Albert-Edward. They were just finishing lunch, but even after the rest it was clear that some of them were struggling in the heat, and at least one was surprised that there were no shadows on the ridge. I didn’t stop to eat, as everyone was ready to walk. We stayed on route, crossed a few small snow patches, spooked some ptarmigan, and by 2:00 pm we were all sharing the view from the summit of Mount Albert-Edward. 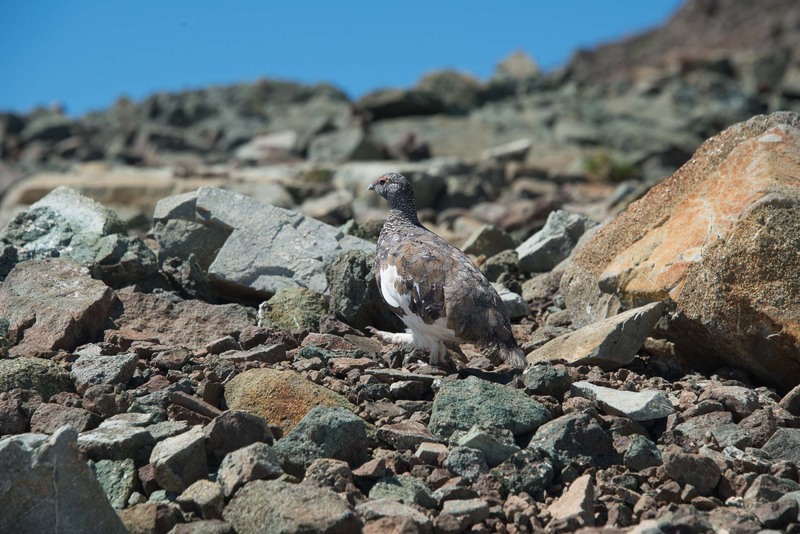 Ptarmigan– I nearly accidentally kicked this bird, and even then it didn’t run away. It must have been a quiet day for the mountain, because we saw only about twenty others on our trip up the ridge. Even on the summit, there were only two other hikers; a couple whom I’d talked with the night before at Circlet Lake, on their way to Ruth Masters Lake. 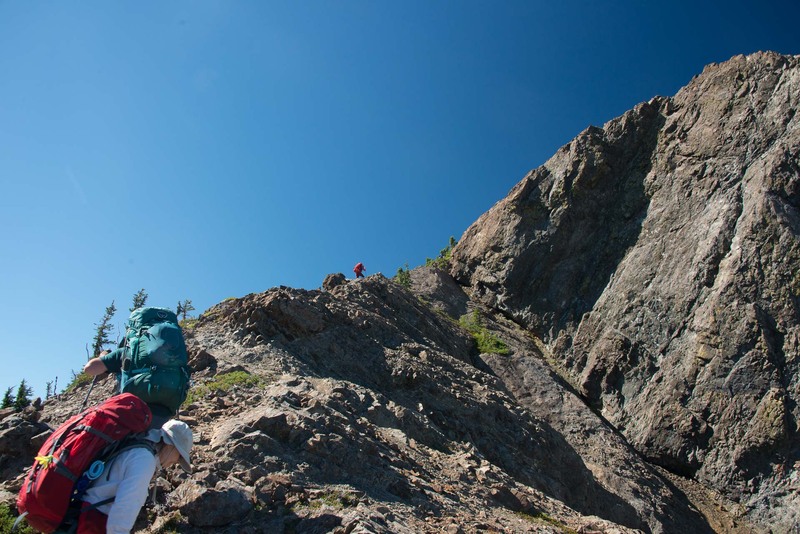 The heat and the bugs chased us off the summit, and folks were eager to get to the day’s camp. 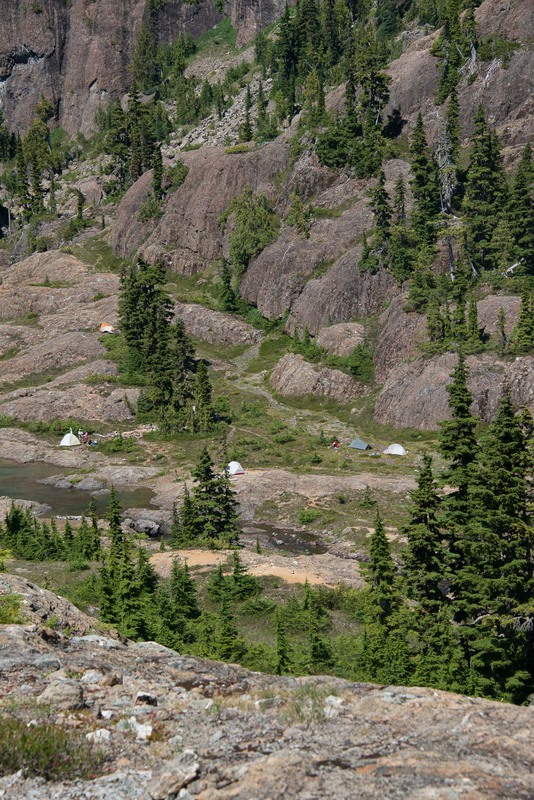 The section below Albert-Edward’s summit and our campsite is the most complex of the terrain on our route. Between 1900 metres and 1550 metres is a series of benches and steppes that slowed our progress. Eventually, we caught up to the couple we met on the summit, and the ten of us descended together. There were two spots that required us to put our hands on the ground to lower ourselves, but it’s possible a different route would avoid these places; I don’t recall doing that terrain on my 2017 trip (though this time, we were travelling in the opposite direction). There are nine people in this shot. Carmen, the start, at the top. Around 5:00 pm we arrived at our campsite. The area had enough space to accommodate the tents (now eight) for our group, tarns for water, and a couple of trees large enough to support our food bags in the branches. After the long day, the group was low-key. Most opted to lounge around the camp to recuperate and avoid the heat of the evening. From camp we looked out over Ruth Masters Lake, our destination for the next day. I watched as the shadows of the evening consumed the lake, shadowing the location. I pointed it out to anyone who would listen; I think people were getting excited to be at the lake. Day Three was a walk in the park, no matter how you slice it. Because the hike was going to be shorter, we allowed ourselves the luxury of a more relaxed start to the day. The biggest challenges on the route were walking along rock bench and a scramble up a rock slope. Both obstacles were easy enough on their own, but a slip could have meant broken bones or worse. Fortunately, everyone made it through with nothing more than a raised pulse. Our only casualty was Ulrike’s bag. When she tossed her bag down ahead of herself, it tumbled end over end a few times before it came to a rest at the lowest point on the traverse, while everyone paused to watch. I’m not sure what others were thinking, but I was imagining what would happen if that bag was a baby. Watch your step, everyone! 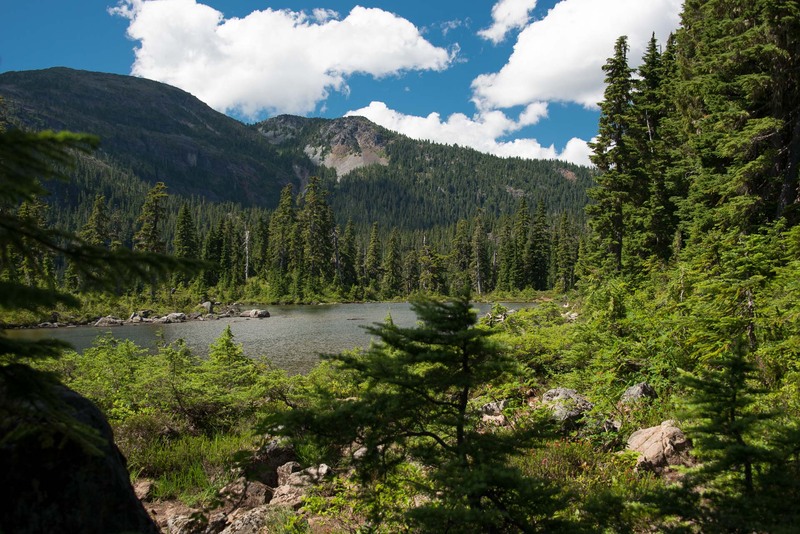 The short rise to the meadow below the lake was done in the sun, but we all pushed forward at a good pace, propelled by the promise of a swim in the cold waters of Ruth Masters Lake. As some folks showered in the small waterfall at the head of the meadow, others carried on for a few more minutes to stake their tenting spot at the lake. Thank goodness this was our day with the least hiking, because the temperatures exceeded thirty degrees! We each swam, rested in the shade, and swam again. Our large group splintered into smaller enclaves, as we each explored the shores of the cirque and the plateaus. Dean and I did a recce hike to pick the best route up the steep slopes at the head of the cirque, our route for the next day. On our return we discovered that all the women were missing. Dean crested a hill to the south of the lake, and I heard squeals and then a chorus of cackles. Dean’s abrupt turn and red face told the story of what was happening: swimming au natural. 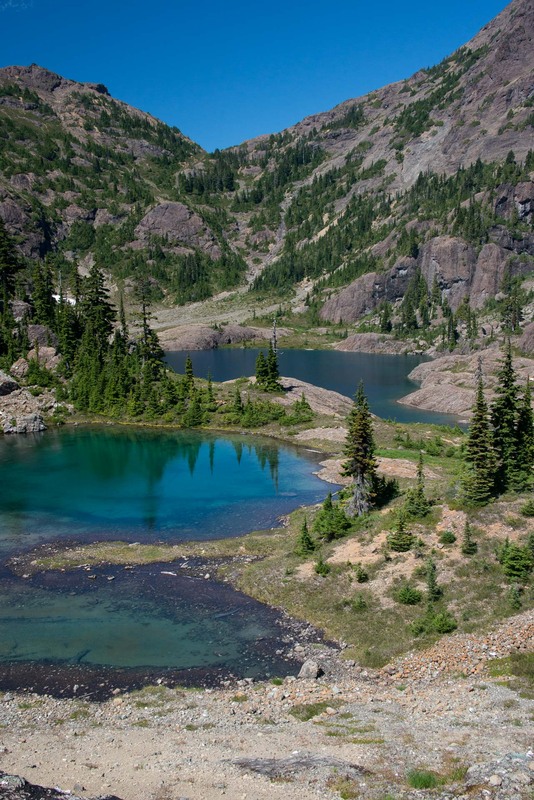 The tarn above the lake is much warmer, very inviting for a leisurely swim over the frigid waters in Ruth Masters Lake. In addition to Dean’s interruption, a very low-flying helicopter took a moment to do a flyby at the lake, waving to the ladies as they swam in the tarn. 8:00 am came too soon. We were walking up the head of the cirque to the saddle between Augerpoint Mountain’s massif and the connecting ridge to our destination, the tarns below Jack’s Fell. The waters of Ruth Masters Lake must have healing powers, because our group moved at an unexpected but welcome pace up to the saddle. 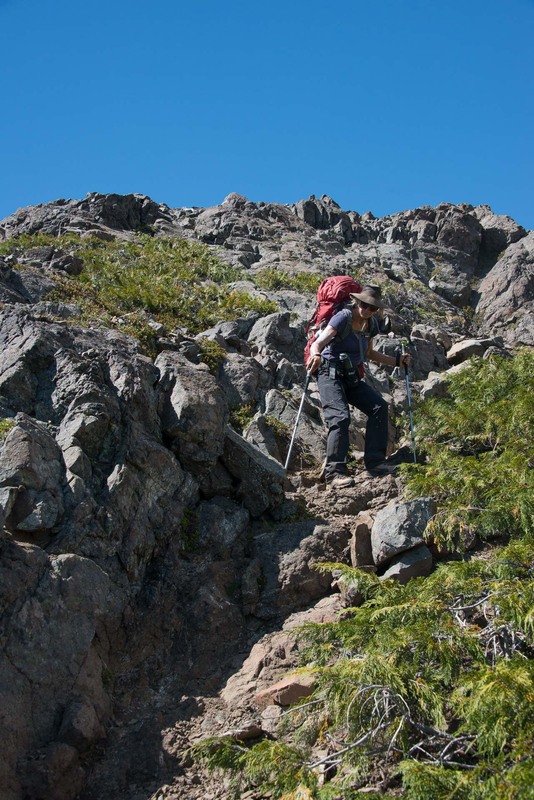 While some stayed behind resting in the shade of a few shrubs, seven of us clamoured up the rock and few sections of scree to Augerpoint Mountain’s broad summit. 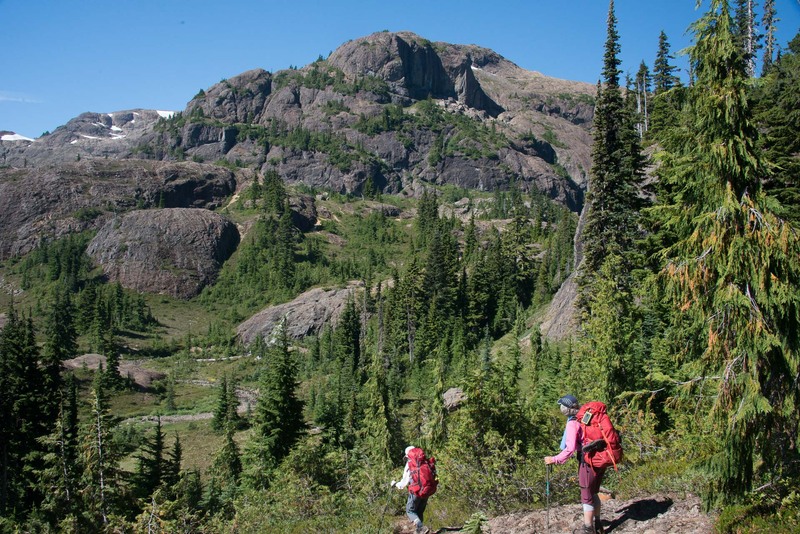 It was a seventy-five-minute round trip; once back at the saddle, we started hiking up the loose rock along the connecting ridge toward our goal. We progressed at a reasonable pace, but the sun beat us down as we trundled west along the ridge, taking in the sights of the highpoints. At the westernmost highpoint, we stopped to rest for lunch in the shade of a few trees. As we all scrunched into the shade of the trees, I appreciated the conversation and chance to rest. I’m sure the view was great, but I don’t recall it — that wasn’t the important part of the moment. By 2:30 pm we were setting up camp at the tarns. I was so hot that I gave up and lay down in the shade of a tree to drink some water. We had only walked for five hours, but the heat had an exhausting effect on all of us. With my leg over my knee and my hat tilted forward over my face, I watched the group mill about making camp. Everyone was a bit pokey setting up their tents, and most people were doing the same as me: sitting in the shade, drinking water. After a few hours of rest, I proposed an excursion to Jack’s Fell, commonly referred to as Northwest Peak. Originally, I scheduled this for the morning of our final day but given the hour and the fact that I expected a very slow descent to Highway 28 the next day, it was best to use the late early-evening hours to summit this non-technical feature. It was a three-hour return trip from our camp at the tarns. The real adventure is the easy, rolling terrain that doesn’t follow a booted track. As a nondescript feature, one that lacks an official name, it doesn’t see a lot of traffic. However, our group made the best of the trip and spent some time looking at the route we had travelled along the ridge that day. I anticipated the descent would take the group around four hours from our campsite, but I allowed for five. It’s a good thing too, because it took a few of us a little over four and half. We were quick enough along the ridge, and even allowed for a final swim at two large tarns close to the start of our descent route, but the descent was slow. 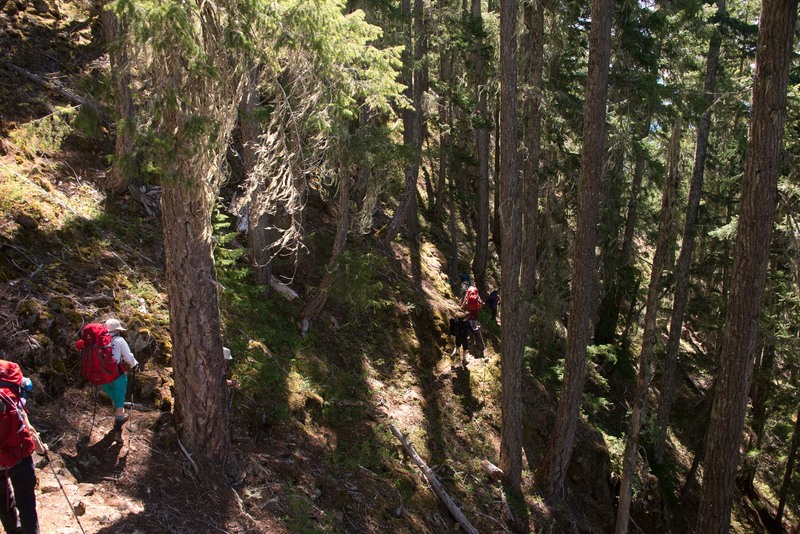 The trail down to Highway 28 makes good use of switchbacks through the worst of the terrain. Although the route has seen a lot of use over the years, the loose gravelly sections are numerous and defy booting-in. We made use of our poles and took our time down these sections. I imagine the heat played a role in our slower progress. 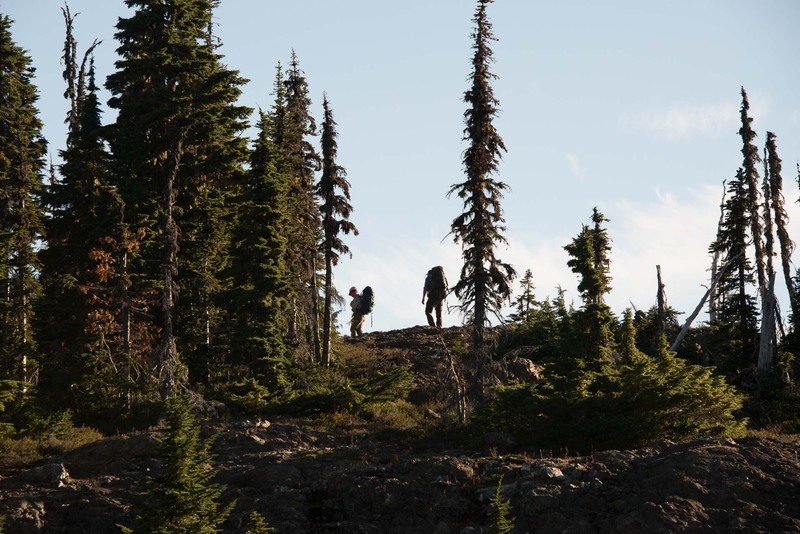 Once off the ridge, the old-growth towered above us, trapping in the heat. Back at the highway, most of the group wandered the kilometer down the road to the Augerpoint day-use area for a final swim. I opted to stay at the trailhead, a blue arrow on the highway, in order to meet our Ambassador Shuttle. In time, the shuttle arrived and the ten of us were soon enjoying the air conditioning on our way back to Raven Lodge and Mount Washington.